Schedules for Stay at Home Moms - Baby, Toddler, Older Children or All of the Above! As I’ve mentioned in my Myers-Briggs posts, I have a very strong “J”,or judging factor, to my personality. I don’t like surprises but day runners, to-do lists and calendars make me giddier than a kid on Christmas morning. I’m sure it’s no surprise that following a daily schedule makes my world spin as it should. The trouble with being such a strong “J” and having children is that children have needs that don’t always fit neatly into a schedule. One area of growth I have experienced since becoming a mother is learning how to be flexible. It’s difficult to have a daily schedule when you have babies and toddlers. I understand that very well, so I in this post I will share separate tips for mothers of younger children and mothers of older children. 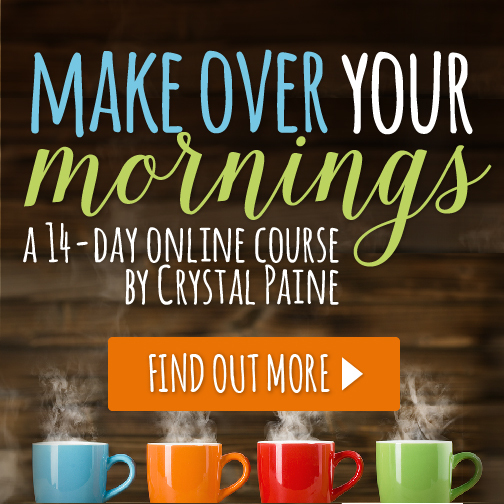 Before I share my tips for scheduling your day and share my own daily schedule, I want to suggest that you check out the Make Over Your Mornings course. How you spend your mornings will set the tone for the rest of the day. Make Over Your Mornings helps you to get ahead of the chaos so that you don’t wake up feeling like you’re already behind. For moms of children under the age of seven, here are my tips for creating a daily schedule. Focus more on having a routine than following a schedule. Children are comforted by routine. A schedule may work for two days until your baby hits a growth spurt and needs to nurse constantly or your toddler gets sick and refuses to sleep. Plan your days so that one thing usually follows the other and keep it consistent. Keep meal times as consistent as possible for toddlers. Have a solid bedtime routine, even if you co-sleep. Relax about the housework. Your house isn’t suppose to be perfect when you have small children. Even if it was perfect, it wouldn’t be that way for long. Shoot for one chore per day that is not dishes or laundry. If all you can do in a day is dishes and laundry, then just do dishes and laundry! Make weekly (or monthly if you are an ambitious mama!) meal plans! Yes. Do it. Love it. Okay, you don’t have to love it, but do it anyway. I’ve created two free printable meal planners to help with this task and I show you how to make a meal plan, as well. If you still struggle to make meal plans, all is not lost. Holistic Squid has done it for you. Check out her real food meal plans! Plan one or two “errand days” per week and limit errands to those days. Leaving the house five out of seven days per week makes you feel like an In-The-Car mom instead of a Stay-At-Home mom! Don’t feel compelled to answer the phone just because it rings. Friends and family tend to feel it’s okay to call stay-at-home moms anytime of the day simply because they are home. If I tried to have a phone conversation while my boys were still babies and toddlers, the house would have fallen down around me! Plan a time each day when your partner is home or after the children are asleep to return phone calls. Be strict with yourself about media usage. It is easy to spend hours online with only one eye and ear attuned to your little ones. Don’t miss their lives because you are staring a screen. Implement a daily quiet time for preschoolers. Toddlers and babies nap during this quiet time. 9:00 — Errands, outside time or following me around “helping” while I cleaned the house. For those of you who have moved on from the constant chaos of little ones, but are still finding that you’re not able to get it all done, here is how I have tailored my days for maximum efficiency. For moms of children over the age of seven, here are my tips for creating a daily schedule. Assign chores. If you are solely responsible for the housework and you have older children, let them take over. Set meal and snack times. If I didn’t have set meal and snack times, my children would eat constantly. I cook all of our meals from scratch, so I have to plan carefully. When I know what time a meal will be, I can plan the preparation time accordingly. Wake up at the same time everyday. I allow myself to sleep in occasionally. And I seem to get nothing done except for cooking on those days. Go to bed at the same time every night. Consistency works. If you never got the hang of menu planning when you had small children, now is the time to get started. I would love to advise you not leave the house every day, but I know you’ve got to take this child here and that child there and that a day at home would be nearly impossible. Instead, use the time that you are watching practice or waiting in the car line to return phone calls or emails. Don’t lose the daily quiet time! Older children don’t have to nap during this time, but they need to play quietly in their rooms or in their own space. Be sure to plan time in your time schedule just for you. I plan a long soak in my giant tub with my favorite essential oils once or twice per week. I read, play games on my iPod or Kindle and even fall asleep sometimes, but it is my time to completely tune out and be responsibility free for about an hour. It recharges me and I believe it is crucial to my health. Here is a sample of my homeschooled children’s routine from age seven and above. Routines and schedules make the day go more smoothly and facilitate to-do list completion. Write down what you need to accomplish daily and work those tasks into a manageable schedule. Having a schedule will allow you to see extra time in your day or if you are truly as over-extended as you feel. Knowing that each task has been considered and accomplished can leave you feeling freer and more relaxed as you move from one thing to the next. Erin Condren LifePlanner – I LOVE these beautiful and functional life planners from Erin Condren. You can even build your own now! Head over now and get $10 off when you use my referral link. 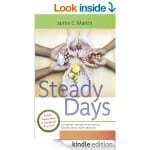 Steady Days is a wonderful book about how to manage your days as a stay at home mom. Her advice is solid for creating a flexible, but structure routine that allows you to get things done without sacrificing the precious few years that you have with your children as little ones. Before I go, I’d like to share one tool with you that helped keep me sane through the years of parenting small children and one that helps me now that my kiddos are older. Motivated Moms has an awesome chore planner that will help you make sure that you remember all of the little things that come along with homemaking. Motivated Moms also has an app available now! Check it out!